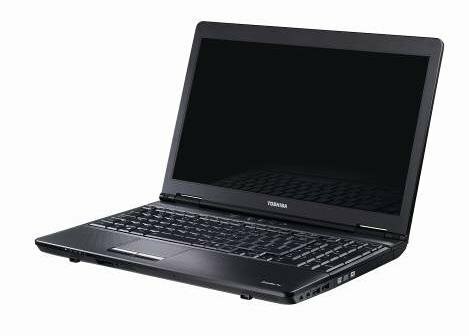 Toshiba introduced the 15.6" Satellite Pro S500, a new Windows 7 laptop with the Intel Core i3-330M 2.13GHz processor, 4GB DDR3, 320GB HDD, Bluetooth 2.1+EDR, 802.11a/g/n WiFi, and DVD burner. The new Satellite Pro S500 models combine extensive connectivity and improved power efficiency within a lightweight chassis, to deliver excellent performance. Designed for flexible business use, the laptop is ideal for users that are looking for a low cost, desktop replacement that can provide excellent all-round performance - from running high performance business computing tasks within the office, to the latest multimedia applications within the home. The stylish Satellite Pro S500 features a new textured and scratch-resistant black chassis, with enhanced ergonomics designed specifically with business users in mind. A large TouchPad makes navigating documents and folders quick and simple, while two large chrome TouchPad buttons positioned either side of an advanced FingerPrint Reader offer an easy way to log-on or access sensitive documents. Four convenient control buttons just above the keyboard provide instant access to a number of useful functions, including a presentation mode, volume control and Toshiba’s Eco Utility software. Developed by Toshiba, Eco Utility is a graphical interface that enables users to both monitor and reduce power consumption, providing energy savings of up to 25 per cent at the touch of a button1. A 10-digit numeric keypad also comes as standard, ensuring increased productivity and accuracy for users who handle spreadsheets or regularly work on numeric tasks. A 39.6cm (15.6”) Toshiba TruBrite® widescreen, combined with HD graphics processing, ensures that documents and presentations are always bright, clear and easy to read. An integrated Mini Display Port also enables users to view content on larger external screens with virtually no loss of quality with optional HDMI, DVI or Display Port cables. Intel’s latest high performance Core i3 processors deliver solid performance for everyday business applications, and 4GB of DDR3 RAM enables users to work on multiple tasks and documents at any one time, ensuring high levels of productivity. High speed Hard Disk Drives (HDD) with capacities of up to 320GB also provide enough storage space for large libraries of presentations, office documents and multimedia content. The Satellite Pro S500 features extensive connectivity, making it easy for users to connect to networks and the internet quickly and easily. The latest WLAN (a/g/n) provides high speed and secure wireless internet compatibility. Seamless USB docking also provides an efficient way to connect to a range of peripherals simultaneously, or instantly re-connect to all devices if users have been working away from their desk. Enhanced Toshiba EasyGuard technology also offers high levels of security and protection for users, whether in the office or on the move. Integrated 3D freefall sensors offer HDD protection against drops of up to 70cm and protects users from data loss should their laptop be knocked or dropped. Each model also includes an integrated HD webcam and microphone, enabling office users to take part in video conferencing with colleagues and associates over the internet.